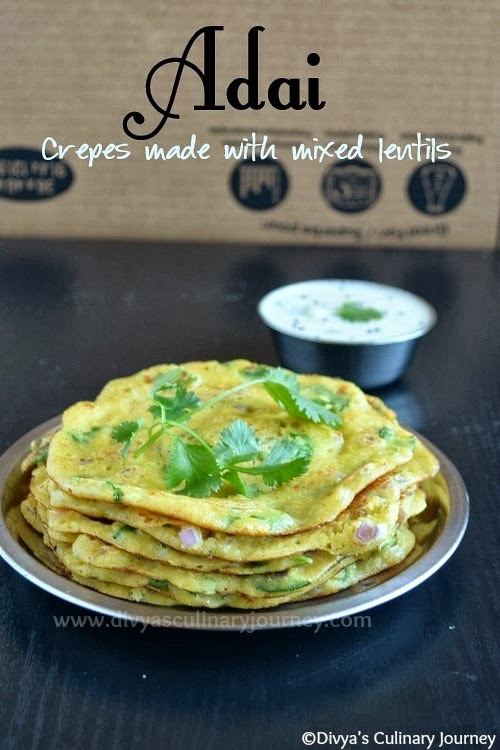 Adai dosa are the crepes made with mixed lentils. The ingredients are soaked for atleast 3 hours then they are ground and then the adai are made right away. No fermentation of the batter required unlike the idly dosa batter. It is very healthy and is Vegan. Soak the ingredients listed under 'to soak' for atleast 3 hours. Then grind the cumin seeds, ginger, red chillies, coconut with a handful of soaked lentils.This is to ensure that they are ground properly. Then add the rest of the soaked rice and lentils and grind them into a smooth batter adding required water. At the final stage, add turmeric powder, salt and asafoetida and run the grinder till they are evenly mixed. Transfer the batter and then add chopped onions, curry leaves and cilantro mix well and the batter is ready to use. Heat the griddle, pour a laddle and spread in circular motion. Then drizzle some oil. Cook in low flame. Then turn it to the other side and cook for few more minutes and then serve it warm. I served it with coconut chutney as I like that combination while the traditional combo is with Aviyal. Each person follows different ratios of rice and lentils. Here I have mentioned the ratio I follow for making adai. 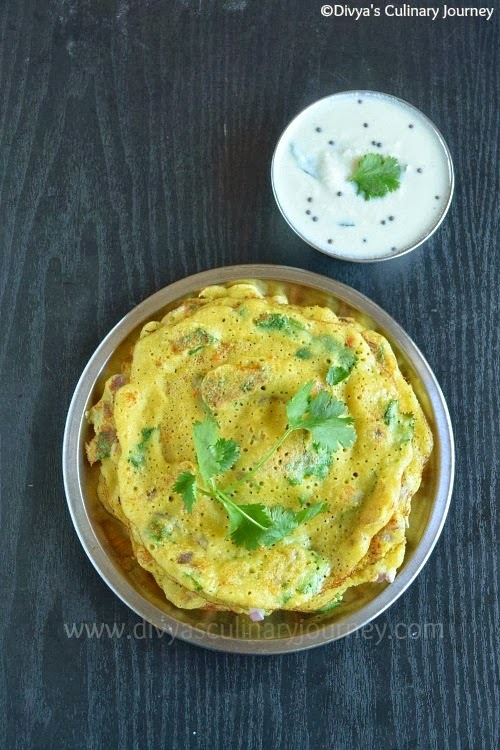 Usually the adai batter is slightly thicker than the usual dosa batter. But once I skipped the onions, curry leaves and cilantro and diluted the batter a little bit and made a crispier version which my kids liked. Instead of cumin seeds, fennel seeds can be added. Adai looks very yummy and beautiful click s also. 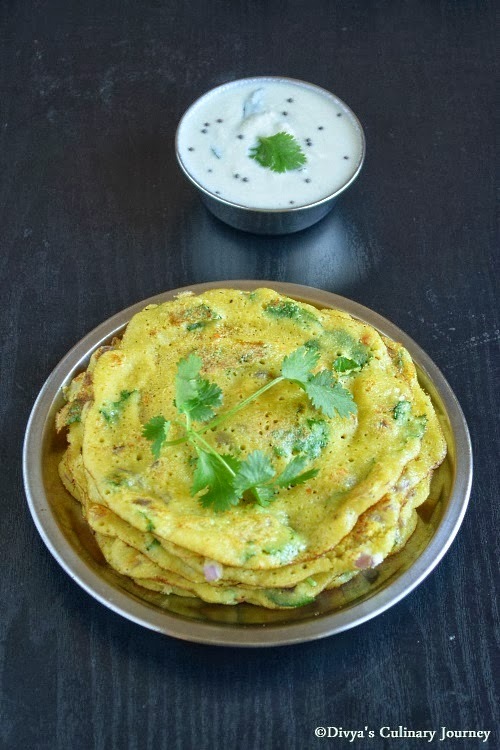 adai dosai looks super delicious and so inviting :) love the way you have stacked them .. makes me hungry here !! Wow ! Looks amazing! Healthy Adai. Adai looks really yummy and healthy too. yummy adais.. any time any day i am yes for adai.. yumm clicks.. Very healthy adais, tempting with the chutney. Your clicks are really beautiful.Ad ai looks yummy and spongy dear. Nutritious adai with spicy coconut chutney, wat a pair;.Love it. Adai look yummy.. My mother makes it often and now i make it for my kids.